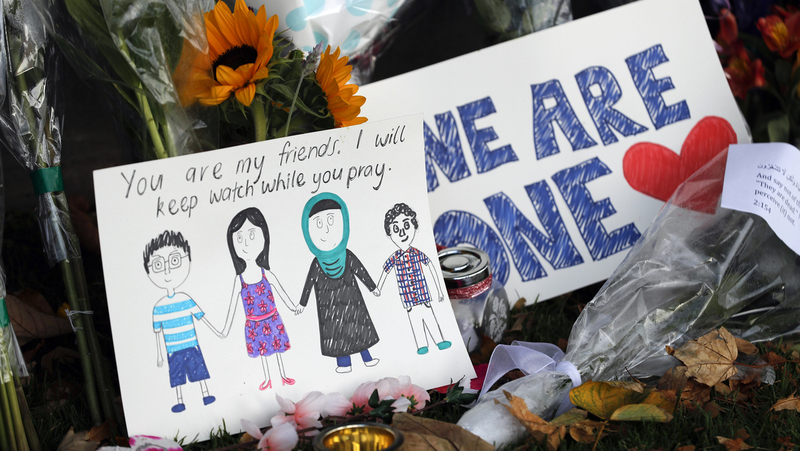 New Zealand Shootings Reveal The Global Reach Of White Extremism In the aftermath of the New Zealand mosque shootings, experts who monitor hate groups say violent white extremism is on the rise and is the most prominent threat. A message card sits among a collection of flowers left at the Christchurch Botanic Gardens in New Zealand on Saturday. A 28-year-old white supremacist accused in the mass shootings at two mosques that left dozens of people dead stood silently before a judge on Saturday. Experts who monitor hate groups say the attacks on Friday at the mosques in Christchurch, New Zealand, follow a sharp rise in violent white extremism around the globe and especially in the United States. "They operate in an ideological world of people that reinforce each other's ideas but may never actually meet each other in person," says Kathy Blee of the University of Pittsburgh, who studies white extremism. It's a common misconception that the average white supremacist is a disaffected white guy with economic anxieties. Blee's research shows that middle-class and even upper-middle-class men from the mainstream are increasingly being drawn into this movement, which is mostly online and worldwide. "A lot of them are very casual viewers initially, and they get pulled into these very extreme ideas," Blee says. Blee says this online world is a lot more convoluted and complicated than we think — people who are already spending huge amounts of time online discover or are recruited into racist communities, they become radicalized and some are prone to act on this anger urgently. "It's more that this world can create people who are aimless, marginalized, isolated and quite extreme in their thinking," she says. Blee was as horrified as the next person about the murders at the New Zealand mosques, but maybe not as surprised. Here in the United States, there has been a spike in white supremacist-motivated violence and murders. According to the Anti-Defamation League, ideologically motivated extremists killed at least 50 people in the U.S. last year, and all but one of those murders had at least some links to right-wing extremism. Only one, according to its recent report, was blamed on Islamist extremism. And during these periods of polarization, and when there is declining trust in communal institutions, who gets targeted? Immigrants, foreigners, people of color and Jews. And therein lies another widespread and dangerous misconception, says Brian Levin, director of the Center for the Study of Hate and Extremism at California State University, San Bernardino. "This threat of homegrown, far-right-wing white nationalism, terrorism and extremism is the most prominent threat," Levin says. Since 2015, Levin says, Islamist extremism directed at Westerners has dropped dramatically — that movement has splintered as white extremism has strengthened. This is also occurring at a time when demographics are changing, Levin says, and there has been a "mainstreaming of bigotry" into public policy debates in the U.S. and around the Western world. "And during these periods of polarization, and when there is declining trust in communal institutions, who gets targeted? Immigrants, foreigners, people of color and Jews," Levin says. Levin is calling for better coordination among law enforcement agencies on this growing threat. He also thinks Congress should investigate and devote more resources to it. Levin and others say political rhetoric from leaders such as President Trump is doing little to help the situation. "We're not getting much, if any, national leadership in terms of how to respond to hate and extremism," says Pete Simi, a sociology professor at Chapman University in Orange, Calif. Speaking to reporters after the attacks, Trump said he didn't believe white nationalism is on the rise. Experts in white extremism say the hard numbers prove the opposite. Simi says, whether intentional or not, Trump also speaks the language ​of white supremacists when he promotes a travel ban against majority-Muslim countries and when he repeatedly talks about an "invasion" of immigrants at the U.S.-Mexic0 border. Trump did so again on Friday, the same day as the New Zealand mosque attacks, when vetoing Congress' attempt to block his emergency declaration: "We're on track for a million illegal aliens to rush our borders," Trump said. "People hate the word 'invasion,' but that's what it is." Simi says that kind of language sends a message to white extremists "that this is not only permissible — it's encouraged." A White House spokesperson on Friday called it outrageous to make any connection to Trump, saying the president has repeatedly condemned bigotry and racism.